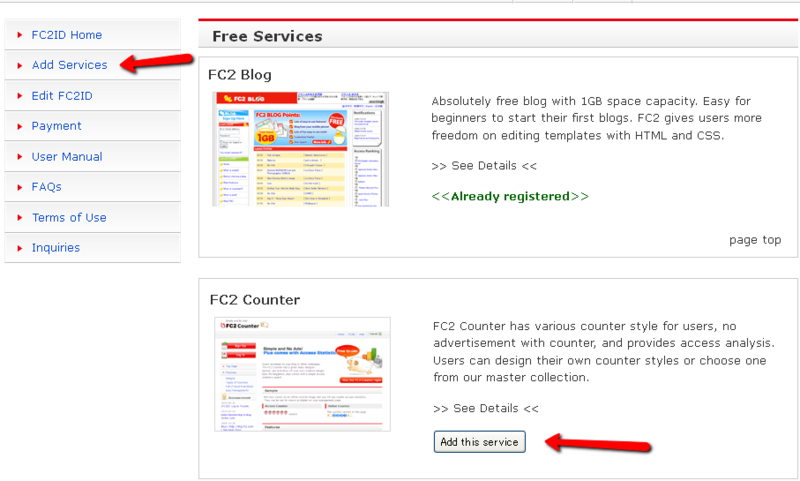 FC2 Counter is a free service. There are two types of counters; Access Counters and Online Counters. These counters are used to keep track of visitors to your blog or web page. The access counter counts the number of visitors you've received. In addition to knowing how many people have visited your blog, it also shows a 30 day graph displaying a breakdown of the number of visitors who visited your blog during that period. Click on the "Sign Up" button on the upper left of the FC2ID registration page, to acquire an FC2ID which enables you to use all the free services provided by FC2. Please enter your FC2ID e-mail address and password in the space provided to log in. FC2ID is an account that you will need to get in order to use all services provided by FC2. It allows you overall control and management of all FC2 services. (Seperate registration for each service is necessary.) Just add what you would like to enjoy with the "Add This Service" and fill in the required information. Please visit the FC2ID Manual for details. Please click on the "Change Image" button on the management page. You can search for counters sorted by "Popularity", "Date Registered", "Genre" etc. Check the counters you want and select whether to set your counter up as an "Access Counter" or an "Online Counter". *What is an Access Counter? An Access Counter is a tally that counts the number of people who have visited your site. *What is an Online Counter? An Online Counter counts the number of people currently viewing your website in realtime.